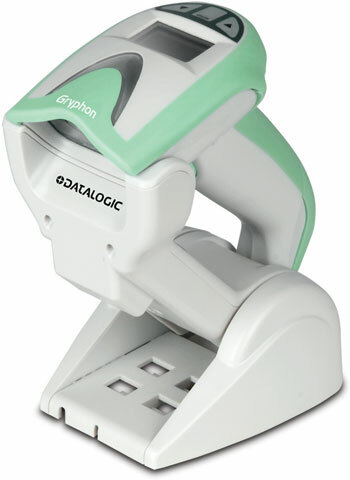 Datalogic's Gryphon I GM4100-HC linear imager with disinfectant-ready housing features a new, patented 2-position cradle that provides multiple solutions to answer different functional and reduced space requirements. It provides hands-free reading capabilities and a scan-while-charging feature to ensure constant up-time for increased productivity. Gryphon I GM4100-HC Batch Mode capability allows thousands of codes to be stored in memory. This feature combined with a long lasting 50K scans per charge Lithium-Ion battery allows unlimited mobility and reliable data collection when out-of-range from the base station. Featuring Datalogic's exclusive patented ï¿½Green Spot' for good read feedback directly on the code, it helps to improve productivity especially in noisy environments. When using the product with the cradle at a 45-degree position, the Green Spot can work as an aiming system remaining on to aid in positioning the code for quick and intuitive reading. Standard multi-interface capabilities (GM4130) provide host connectivity via USB, RS-232, Keyboard Wedge and Wand Emulation while IBM interface models (GM4110) provide connectivity via IBM 46XX, USB and RS-232 emulation. The Datalogic Aladdin configuration program provides user-friendly features that simplify the start-up procedure, even for inexperienced users. GM4100-HC-910	 Gryphon I GM4100-HC, SCANNER ONLY, 910 MHz, Health care Housing. Cables and accessories must be purchased separately. The Datalogic GM4100-HC-910 is also known as Data Logic	DTL-GM4100HC910	or GM4100HC910	.